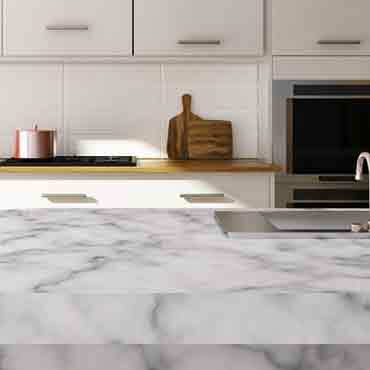 Marble counter tops are not often seen in whole kitchens because of it's exceedingly high price. To get an opulent appearance, use it as an inset at a baking center or use it on a kitchen island. Depending on its veining and color patterns, marble countertops can also make a room appear chic. Marble requires persistent upkeep as it easily stains unless professionally sealed. Some new marble sealers impede staining. Marble counter tops are impermeable; heatproof and stunning but are expensive and can scratch and stain.